Sounds cool. But which one's Angus? 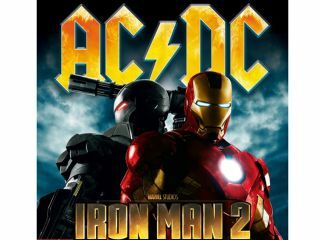 AC/DC have revealed plans for a gonzo performance at this summer's Download Festival which will also serve as a tie-in to their involvement in the soon-to-be-released movie Iron Man 2. Full details of the blow-out show are still sketchy, but according to Classic Rock magazine, AC/DC are looking to have a fleet of 50 jet pack-equipped 'Iron Men' descend from the sky and land on the stage at the end of the band's set. The 'Iron Men,' who would light their way through the darkness by igniting powerful 'chest beams' on their costumes, would most likely take off from the nearby East Midlands Airport. The flight is expected to take about 10 minutes. "It seems logical to capitalize on our links with the Iron Man movie franchise at Download," said Don Heck, the Australian band's spokeperson. "It will be very dramatic to see an array of searchlights strafing the Download audience from the sky above." Heck also said fans can expect searchlights and cannons blasting in the sky, making for a live show that will be even more over-the-top than AC/DC's usual concert spectacle. "I must stress this is not 100 percent confirmed," he said. "Obviously, there are some serious health and safety issues to consider. But if anyone can pull it off, AC/DC can." UPDATE: As a click here will attest, looks like we and the rest of the world got pwned by a (in our defence) just-about-believable April Fool by Geoff and the guys over at Classic Rock. Apols to all AC/DC fans, comic fans (we should've spotted the Don Heck reference…) and the Marvel universe in general. Would've been a great stunt though, right? Right? Ah. Rather than hide our shame, by way of apology we offer this Comic Guy-friendly clip of Wings singing Magneto And Titanium Man and promise to make proper amends to AC/DC freaks in our forthcoming Metal Week (more of which soon). We also promise to get Classic Rock and get them good.